When setting up Yahoo mail account, it gives me an error, what should I do? 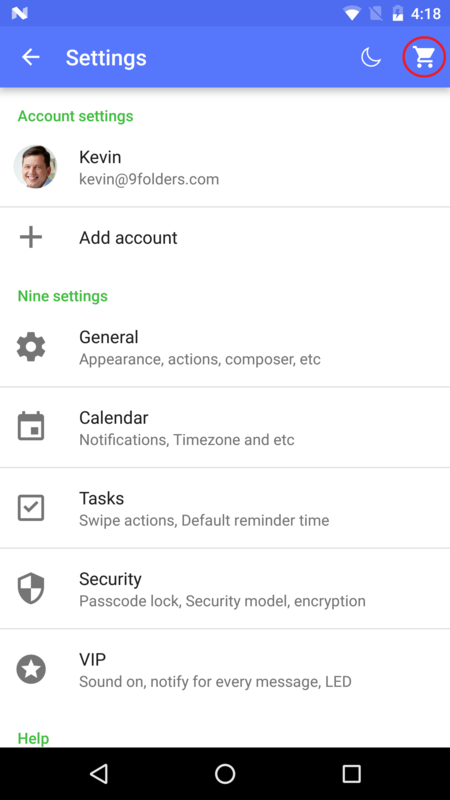 Can’t setup Nine with Gmail account. How do I set up my Gmail account? Gmail users, other than paid Google Apps users, won’t be able to set up accounts using Google Sync (ActiveSync). Please refer to the following link. http://support.google.com/a/bin/answer.py?hl=en&answer=2716936 You can set up your account on Nine if you are a paid Google Apps user. How do I set up my Outlook.com/Office 365 account? I can’t seem to get Outlook email categories to sync with my Nine emails. Categories are not able to be synced via ActiveSync protocol. It is an ActiveSync protocol limitation. If the emails including categories are synced from server, Nine extracts the categories values separately and then store them in Nine DB. If you set the categories on emails and the emails are synced to Nine, you can see the categories on Nine. The category color is unable to be synced as well, so you should change the color on Nine manually. You can change the category color with the following steps. I can’t see any of my exchange folders in Nine. I can see top level folders like inbox etc but nothing below that level. At the moment it’s only possible to delete emails directly from the notification. It would be brilliant if there was another button to mark an email read. You can customize the notification actions with the following steps. Is there a way to setup a custom alert from VIP sender? How can I turn off notifications for a particular folder even if it is synced? How can I change the notifications for email? I just purchased Nine application from Google Play. I would like to know how to activate it, cause I don’t receive any license key. I saw it was available for purchase now, but I can’t seem to find a way to do it. You can purchase Nine from Google Play via in-app billing. Please purchase with the following steps below. Is it possible to select contact-specific ringtone in Nine for Android? 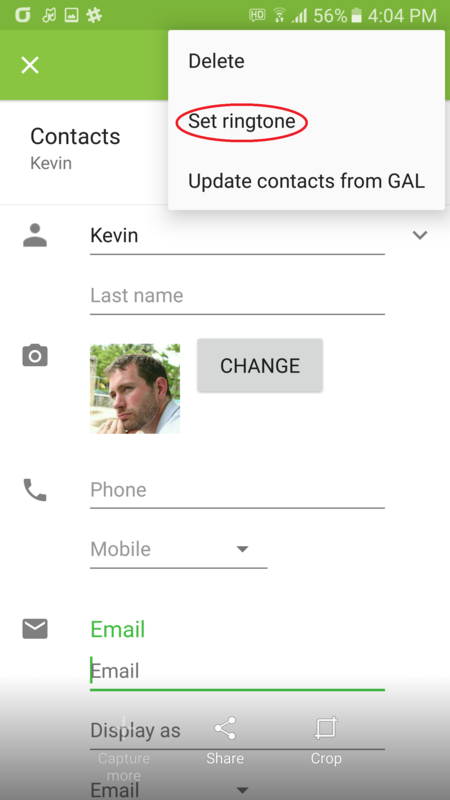 I am having an issue with the sync between 9 Folders Contacts and the native Android App Contacts. 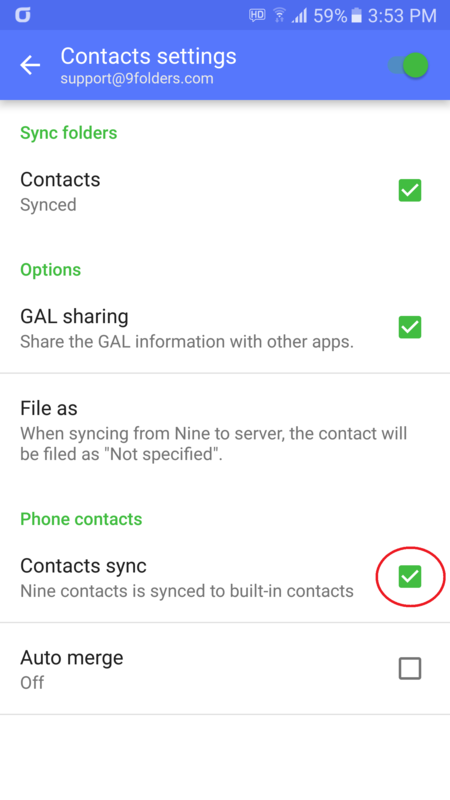 To display Nine Contacts on Phone Contacts, the following setting should be enabled. I would like to know how to set the app up to automatically download the full email message. You can change the download email size with the following steps. When I open a conversation, I would like to have all messages in that conversation marked as read. Please use the following option, and whole emails in the thread will be changed to Read when opening the thread. How can I set the automatic Cc/Bcc option? What is the procedure to refresh the folder list under the Inbox? Please crick the sync icon with the following steps and then the folder list will be refreshed. I’m not able to find any option that allow me to change the “conversation mode” list, I would use a normal email list sorted by date or sender. You can turn off the conversation view with the following steps. What is the difference between the Favorite and Favorite+ folders? Can you tell me how to customize the Peak Schedule settings in the Sync Settings within the Nine email client please? These settings appear to be greyed out. To set the peak schedule, the sync frequency should be set as “Peak” first. Is there a way that I can add an image (company logo) to my email signature? How do I modify the default signature and add an image (company logo) to my email signature? You can change the signature with the following steps. Is there a way to add shortcut directly to Calendar/Contacts/Tasks/Notes?